The Detroit Red Wings’ 2015-16 season has had its share of highs and lows. Through 52 games the team sits 7th in the Eastern Conference, hanging on to one of the two wild card spots. They have played admirably on the road this season, but the team’s offense has been anemic, and too many players are playing below their capabilities. Arguably, unless your name is Dylan Larkin or Petr Mrazek, your play this season is open to criticism. Any number of players could improve their play down the stretch, but some will have a bigger impact than others will. As Detroit pushes to keep its playoff streak alive, the following players will need to step up down the stretch. In order for the Red Wings to further their push for a 25th consecutive playoff berth, Tomas Tatar will need to produce more. At just 24 years old, Tatar led Detroit with 29 goals in 80 games last season, but only has 15 through 51 games this season. That’s not a pace to build on a career year. But pace is tricky for any player who struggles with consistency; Tatar has just four goals over his last 21 games. 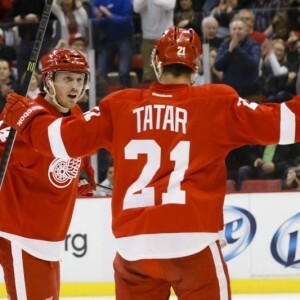 With a gritty, go-to-the-net goal against the Islanders on Saturday, Tatar seems to be playing with confidence again. Since the All-Star break, Tatar has posted four points (1 G, 3 A) through three February games, going plus-1 and registering eight shots. Part of Tatar’s reduction in points this season can be attributed to his time on ice. Last season, Tatar averaged over 16 minutes a game, this season, Blashill has held the sniper to just 14:54 ATOI. Detroit is the only team that has not been shutout this season, but the offense as a whole has been hot and cold this season. Tatar has controlled play consistently through his career and currently has a Corsi-for of 55.9%. Meanwhile, Detroit is also 16-7-2 this season when Tatar registers at least a point, it’s time for him to show up game-after-game and receive more ice time. One of the biggest criticisms of the Detroit Red Wings this season has been their lack of goal scoring. Certainly, assistant coach Pat Ferschweiler can shoulder some of the blame for the team’s anemic power play, but at the end of the day, the players need to do a better job of cashing in on their opportunities. Ken Holland signed Mike Green in the offseason to generate offense. With 21 points through 46 games, the 30-year-old blueliner leads all Red Wings defenders in points. The production has been consistent, too, as Green’s notched 5 or 6 points in each of the last three months. However, there is room for improvement, and the best place to start is on the power play. Really, it’s not a knock Green’s work on the power play this season – until recently he was not used on the team’s first unit. Despite that, 12 of his 21 points this season have come with the man advantage, placing Green within the top 20 defenders in the league in power play points. Just being patient at the blueline and making sure the puck gets to the net on a more consistent basis will improve Detroit’s power play. With the team hanging on to one of the wild card spots in the Eastern Conference, finding a way to generate more offense will be critical down the stretch. With Green manning the point on Detroit’s top power play unit, his offensive contributions are going to play a huge role in the Red Wings fending off hungry teams trying to sneak into the postseason at their expense. In order for the Detroit Red Wings to up their game and seize control of a playoff spot for a 25th year in a row, Henrik Zetterberg needs to step up his game. The stretch run is critical for the Red Wings and their slumping captain. Scoring five points in 11 January games isn’t the worst production output, but the Red Wings need their captain to solidify his line to create scoring depth. Now paired with Pavel Datsyuk, perhaps Zetterberg can start lighting it up in February. In three games this month, Zetterberg has an assist and is minus-3—not exactly what you’d expect from one of your top two-way players. Zetterberg has also struggled with maintaining possession along the boards when in the attacking zone—something that is usually a strongpoint of his. If Zetterberg can regain his ability to work the puck down low and open up space, the Red Wings will have a much easier time scoring, especially with linemate Justin Abdelkader mucking it up in front of the net. Zetterberg has the vision to work down low and find his teammates through traffic. And if he can get multiple defensive players’ eyes on him, then all the better for Red Wings looking to get open. Along with Tomas Tatar and Gustav Nyquist, Zetterberg has not been scoring at the clip we are all familiar with this season. However, if those three can start producing closer to their typical numbers, the Red Wings will cruise through the remainder of their schedule and enter the playoffs with a very deep forward unit. 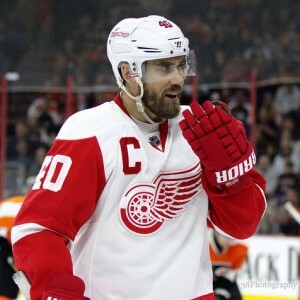 And is Zetterberg starts scoring, the team will certainly feed off of the captain’s success.